How Do Organic Seedless Navel Oranges Exist? Imagine your weekly grocery shopping trip as you’re decidedly strolling through the produce department, searching for the fruits and veggies on your list to bring back home. A display of bright, organic citrus catches your eye and it’s impossible not to grab a few for the coming days (even though they weren’t originally on your list). If you look closely at Homegrown oranges you’ll see that, like other navels, they’re (mostly) seedless. Wondering how an organic navel orange can be seedless? Let us start from the beginning. By the time we’re done, we’ll have hopefully cleared up some of the most common misconceptions. Where did the Seedless Navel Orange Originate? You have probably enjoyed navel oranges for as long as you can remember, from your elementary school lunch tray to your own kitchen table. Have you noticed that they usually have few-to-no seeds, even the organic ones? The navel orange is a popular fruit that you can find in almost any grocery store produce department when they’re in season. They’re also a staple for many families because they’re sweet, seedless, and offer the right amount of tang in the creation of a sunny dinner dish. Even though navel oranges are relatively easy to get your hands on nowadays, it’s important to remember that they started out much seedier, and what an intriguing origin story it is. In the 1800s, on a Brazilian plantation a seedless orange was born from a rebellious, but natural, mutant tree that normally produced a seedy piece of fruit. Typically, this type of mutation would have gone unnoticed if left alone in the wild, eventually dying off. Thankfully for us, the farmers on the plantation took an interest in the mutation and continued to cultivate it. The farmers may not have realized it but they were forward-thinking for their day. A couple of years after the mostly seedless mutant tree had been discovered a dozen seedless cuttings were sent stateside to the USDA, which was the beginning of the golden seedless navel boom here at home. How did the Brazilian farmers do it? They took a shoot from the original mutated tree, called a scion, and grafted it onto a compatible young tree, called the rootstock. Through great care, the scion and rootstock grew together as one; changing the way the world consumes navel oranges. What began as a coincidental mutation ended up providing an improved, seedless navel orange. To make a long story short, that one mutant tree and the farmers who cared for it can take credit for today’s modern navel oranges. How did the mutation allow for the growth of a seedless piece of fruit? When looking closely at the mutation it shows that the buds of the fruit were faulty and the ovules malfunctioned. Without fully-operational ovules, seed production was unlikely. Every seedless navel tree is, in fact, grafted. Why? When no seeds from a navel orange exist we can’t rely on the traditional planting methods to produce new trees. In other words, our growers (or tree nurseries) grafted each tree in their grove. Does Mutation Equal Genetically Modified? What isn’t common knowledge is that GMOs are banned from certified organic production. Make no mistake, we completely understand how the terms “grafting” and “mutation” can sound intimidating and science-like. But they’re actually agricultural phrases. Here’s where you get to let loose a big sigh of relief. Organic navel oranges are not genetically modified. A GMO is something that has been modified through genetic engineering. In the case of the navel orange, the seedless trait was a naturally occurring mutation that was kept alive and thriving. Mother nature has a mind of its own and mutations simply happen from time to time, farmers just made sure it stuck around! Without knowledge of nature’s mutation, we’re frequently asked how our seedless navels can be truly certified organic. 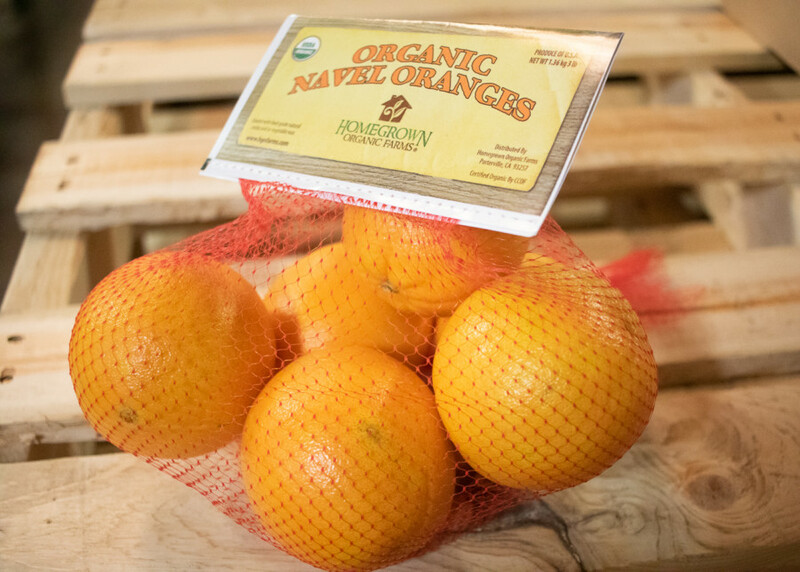 Our seedless navel oranges, we assure you, are fully certified organic. How? Farmers start off with rootstock on which they graft the navel scion. Finally, farmers continue to raise the new navel orange tree according to the USDA’s organic crop production standards. We know, another big relief, right? Keep in mind, it is possible to encounter a few unexpected seeds. It’s nature’s way of keeping us on our toes. There are a number of ways this can happen. Certain citrus varieties have both male and female parts and are a complete flower, but that does not eliminate the occasional seed. It’s not an uncommon occurrence. Precautions against this are commonplace and routine among citrus growers, though. One way this is done, for example, is that trees are covered with nets (on some varieties) with the hope that bees cannot get through to pollinate. Occasionally, though, a sneakier-than-average bee manages to slip through the net and potentially cross-pollinates the viable bud. After that, the fruit will likely contain seeds. It is important to remember that when seeds happen it’s normal and completely safe. Commercially (and legally), seedless fruit is defined as having zero to six seeds. Although it may seem strange, remember you are enjoying an orange with fewer seeds than your run-of-the-mill, pre-mutation navel would have had. When you find yourself running into the occasional seed, try and remember there’s only so many things farmers can control, when up against the forces of nature. So, go! Enjoy a worry-free orange eating experience now that you’re equipped with the history of navel oranges! How much of this information was new to you? Share your thoughts with us on Facebook, Twitter, and Instagram. Thank you so much for your efforts and for sharing.